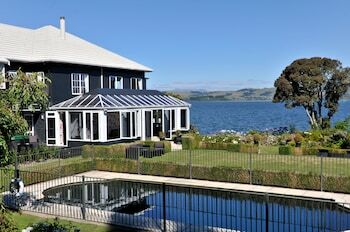 When you stay at Black Swan Lakeside Boutique Hotel in Rotorua, you'll be on the beach, within a 10-minute walk of Lake Rotorua and Mokoia Island. Featured amenities include a business center, express check-in, and express check-out. Event facilities at this hotel consist of conference space and a meeting room. A roundtrip airport shuttle is provided for a surcharge (available 24 hours), and free valet parking is available onsite. When you stay at On the Beach Bed & Breakfast in Whitianga, you'll be on the beach and within a 5-minute drive of Buffalo Beach. Free self parking is available onsite. Located in East Taieri, Silver Peaks Lodge Bed & Breakfast is in a rural location, within a 15-minute drive of Brighton Beach and St. Clair Golf Club. Free self parking is available onsite.